REPORTER FILE PHOTO | An adult female black-legged tick. Sometimes referred to as a deer tick, this species can transmit Lyme disease. This is the first installment of a two-part account of a forum on tick-borne illnesses in Sag Harbor last week. Part two will appear next week. Bitten by a tick as a child during a summer stay in Bridgehampton, Ally Hilfiger began experiencing full-blown flu-like symptoms and joint pain by age seven. Over the next 11 years, she was diagnosed by different doctors with diseases ranging from arthritis to fibromyalgia and multiple sclerosis. At age 19, she saw a psychologist in Connecticut who said “this sounds like Lyme.” Earlier blood tests for Lyme, she recalled, had been “marginal or inconclusive.” With this diagnosis, however, “which included a co-infection” with babesiosis, she embarked upon a seven-year regime of antibiotics and IV drips. The forum, “Lyme Disease in the Hamptons — What You Need to Know,” was presented by Time For Lyme, Inc. on August 19 at Bay Street Theater. Four panelists provided detailed information on the disease, including updates on the latest research, common misconceptions, prevention strategies and a personal story of mis-diagnosis. Time for Lyme is a non-profit organization based in Greenwich, Connecticut, the mission of which is to fund and promote outreach for Lyme and other tick-borne diseases. According to co-founder Diane Blanchard, the group is dedicated to increasing awareness of the diseases through education and prevention programs. The panelists included George P. Dempsey, M.D., a family practioner in East Hampton who has been studying Lyme among his East End patients since 2000; Darin G. Wiggins, M.D., chairman of the Department of Emergency Medicine, Southampton Hospital; Benjamin J. Luft, M.D., an academic physician, researcher and chairman of the Department of Medicine at Stony Brook State University, who is involved in research on the disease; and Ms. Hilfiger, the Time for Lyme spokesperson who told of her long struggle with the disease. The panel was moderated by Dr. Luft. There are now some 10 tick-borne diseases that have been identified and at least 32 percent of infected ticks carry more than one pathogen, making co-infections like Ms. Hilfiger’s very common, Dr. Dempsey said. Spring is the most active time for nymphs and is the time, he said, “when we see the most disease.” Nymphs tend to be down low, in leaf mulch and other warm, moist areas. 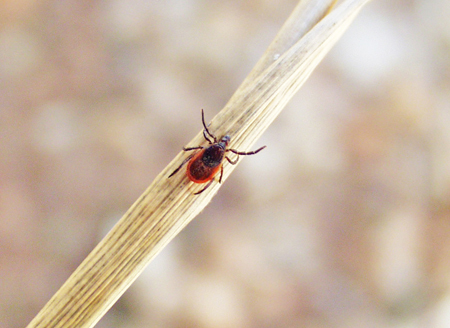 Adult ticks, on the other hand, are capable of jumping and are often found in high grass or on animal trails. “They have a highly developed sense of smell and wait for an animal, such as a deer, to come by and then jump on it.” In general, ticks do not like dry environments, windy settings, beaches, rocks and pebbles, which is a good list of landscaping “do’s” that will help minimize the tick population on a property. A tick bite rash usually doesn’t hurt, it is not that itchy, the area tends to be warm and the bite site gets progressively larger. “If the rash lasts more than two or three days and is larger than a silver dollar, then it could be a tick,” he said. While the bull’s eye rash is believed to be the hallmark of Lyme, Dr. Dempsey was quick to point out with slides that there is a wide range of rash-like manifestations.